When Ella was about two, we bought a memory game at a garage sale for a dollar. 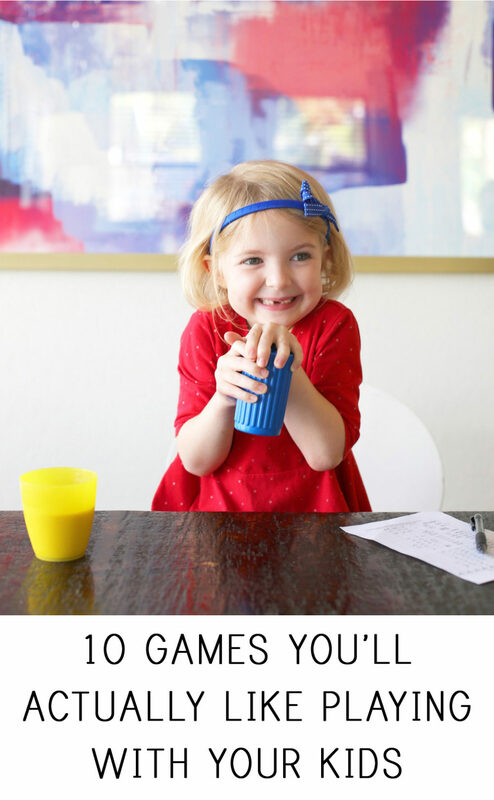 I cannot even begin to estimate how many times we played that game (I also think I probably permanently injured something with all the time I spent stuffed into the tiny little IKEA chair while we played), but it had to be hundreds. I actually quite like playing Memory, so I didn’t mind all that much. So when we saw practically brand-new versions of Candyland and Chutes & Ladders a month before Christmas at a garage sale (we were obviously really into garage sales in Texas), we snatched them up for gifts for Ella. I can deal with Candyland (even if they did change “Queen Frostine” to “Princess Frostine” which is much less satisfying to say), but Chutes and Ladders? That game makes me want to gouge my eyes out. It takes FOREVER to play and invariably, just when it’s finallllllllly almost over, someone goes down the longest chute and you’re staring down the barrel of another 20 minutes of play time. Of course, my girls love playing games, and I actually really love games myself, so we’ve started to build up a decent little collection of games that we all enjoy. Spot It. We bought this years ago and played it with adults many many times. Now my girls are old enough to play it too. Each card has a bunch of different pictures on it, and you each hold a card in your hand with the rest of the cards in a stack in the middle, and you try to find what picture is on both your card and the top card of the stack – if you’re the first person to call out the matching picture, you get the card. Whoever has the most cards at the end wins. There are several variations in the instructions, so you can change it up if you get sick of one variation. Sleeping Queens. This was a gift for Ella for Christmas this year (I mentioned it in this post) and it has been a HUGE hit. The girls and I play it almost every day, and I like that it’s fast enough that we can play in 10 minutes or so. There are twelve queen cards, and you use the other cards to pick up the queen cards, steal other people’s queen cards, or put their queens back to sleep. Definitely the family favorite right now. Peek A Doodle Doo! Bart’s dad and step-mom sent us this one for Christmas, and it’s so clever and fun. You have 15 nests and 12 of the nests have a chicken on top with an egg under them. You pick up a chicken and move it to an empty nest and place the egg in the chicken coop. If you pick up a chicken that doesn’t have an egg under it, which gets trickier as more eggs are moved to the chicken coop, you lose a point. Once all the eggs are the coop, you reverse it and start putting the eggs under the chickens, trying not to pick up a chicken that already has an egg under it. It’s a fun little memory game and goes very quickly. Plus, the pieces are just darn cute. Bingo. We have both a standard bingo game (complete with little tile dispenser) and a gorgeous animal bingo game we’ve had for years, and my girls love them both. And I like a quick game of bingo. Trouble. When we lived with my parents a few summers ago, Ella basically wanted to play this around the clock, and fortunately, with my parents around, she almost could. Also, what is it about that little dice in the popper that is so addicting? Chicken Foot. At Thanksgiving, Bart’s grandma pulled out our domino set and taught a bunch of the cousins to play this game. I’ve always had a soft spot in my heart for this game, so I’m usually willing to play a couple of times. Just make sure you’re at a big enough table. Richard Scarry’s Busytown. This was another one we gave the girls for Christmas, and it’s really fun. The board is about 6 feet long, and I love that it’s not competitive – you work as a team to all win or lose. And it’s simple enough for anyone to play, and it’s fast (this is another one we can crank through in 15 minutes before quiet time). Uno. We took this with us to London because it took up basically no space, and we played it in many hotel rooms and on train and airplane tables as we traveled through Europe. It’s a good way to strengthen number and color skills, and if you lose a card, it doesn’t matter. Yahtzee. Oh man, we have played TEN MILLION games of this over lunch this year. I really love it, plus it’s great for math skills. We have printed off so many extra score cards because we go through them super fast. Any games your young children can play that don’t make you want to fake a terrible illness? And more of our favorite suggestions here! This is great! My son turns three in a month, and I needed some ideas for gifts. Thanks! The title of this post made me lol! There are so many awful games for kids. We just picked up a game called Rampage at our bookstore this weekend. It was actually on clearance ($18 down from $60 … obviously overpriced). The idea is that you're a dinosaur or Godzilla-type-thing and you have to knock over buildings that your opponents built. But, the moves are named things like 'blowing power,' so you put your chin on your guy and blow towards the building you're trying to knock down. It's very hands on and so fun! Rampage being on clearance probably had to do with it being an older copy of the game. The new title is Terror in Meeple City (I think there were trademark issues with the name so they had to change it). As for the pricing, $60 is on the high end of average for non mass-market hobby games these days, and Rampage falls squarely into that category. I had entirely forgotten about Enchanted Forest! My sister and I used to LOVE this game as kids…I just put it in my Amazon cart to gift my niece (her daughter) next month! I'm hoping she'll ask if I want to play with her. 🙂 Thanks for this post! I agree, game night sometimes is torture! If you like Richard Scarry's Busytown, his Airport game is fun too! Ugh, I didn't even like Chutes and Ladders as a kid! NO way is that one coming into my house. Saving this post for when my kids get a little older! We just taught the kids Pit, and the 4 yo has won legitimately without help more than once :). Slamwich and Topple are good ones, too. Thanks for this list! Enchanted Forest won the Spiel des Jahres (Game of the Year) award in 1982, so it's good to know it has held up over the years! It's on my list of games to add to my collection at some point. In general, Gamewright (company that publishes Hisss) and HABA (company that publishes Animal Upon Animal) are both excellent sources for quality children's games that adults can still enjoy (or at least tolerate). We like Hoot Owl Hoot. It's cooperative so no one cries when their sibling wins. I do really like Uno and Spot It, but I've also totally tried to hide Don't Break the Ice because I hate having to set it back up time and time again. 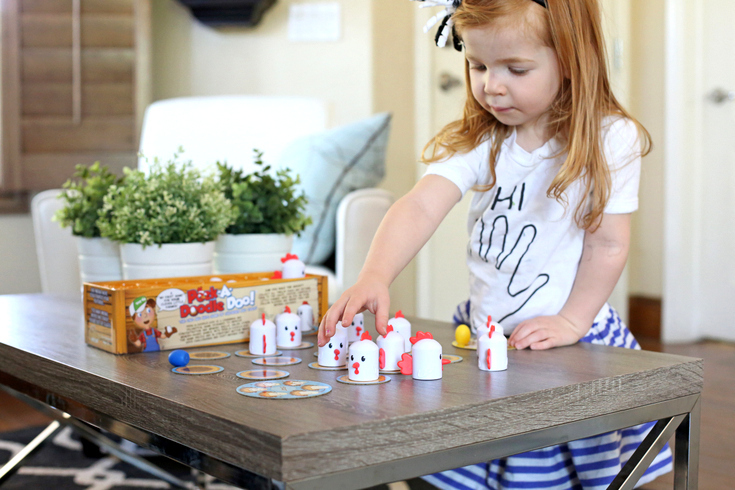 We like the Ladybug Game (fun for both my 3 and 6 year old). We love the game called Dutch Blitz. It can be as physical/competitive of a card game as you wish. Great for number and pattern recognition. Can be played with 2-4 players, but we play in teams at holiday gatherings. The box says for ages 8 and up, but I know 5 and 6 year olds that play it. A family favourite that goes everywhere with us! We like spot-it enough that I often carry it in my purse. Great to break out if we have a long wait somewhere. I grew up playing rummy with my grandparents. All you need is a deck of cards so it's easy to travel with. I have fond memories of playing rummy at family campouts! So many of these are great, timeless games that your kids will enjoy for many years to come. Spot It, Trouble and Uno are games my kids still love at ages 12 and 13. Uno and Trouble are favorites in this house.. add we just added Qwirkle to the list.. it's a great family game. We play sleeping queens and many others from that line. Favorites are rat a tat cat and go nuts. Lots of yahtzee, but we edit the rules – how many rolls to get a yahtzee, have to keep score in order, etc. Double shutter tin is a good solo game. My 8 year old got clue for christmas and we love playing it. This one is a hit at our house. We can play as a family. The adults can battle it out. Just the kids can play. My kids even enjoy playing with it by themselves. Super east set-up and clean-up! I don't hate it! Another vote for Suspend. Maybe because it’s a game I totally beat my husband every time. The kids have fun, too. 😉 But we know my priorities. I game I actually love to play that the kids can join in on is Blokus! I find it so fun. I second Sleeping Queens…my 9.5 year old son loves it. We like Dutch Blitz a lot too. I don't mind playing Guess Who, Clue, or Battleship. Oh! Tapple is great! You can't get any easier as far as set-up and clean up goes. My son loves it and it is easy to take on the go. My daughter go the Disney Eye Found It game last year for her birthday and I was like "No, no, Grandma, you can't do this to me!". It is a suuuuper long game (think 1 hour long sometimes)… but to my surprise, it is actually really fun! I can play that game and actually enjoy myself (and not want to think of the perfect excuse to leave the house whenever she suggests it). TOTALLY agree with you about Chutes and Ladders… I feel a huge sense of relief when someone FINALLY makes it to the end. 😉 A game our boys LOVED at that age is 'The Sneaky Snacky Squirrel Game'… it's easy but lots of fun. Some of their friends talked about it so much after playing it at our house that their families purchased it. 🙂 We also play Go Fish and Jenga a lot. Ug. Chutes and Ladder makes me stabby. In addition to it taking forever Eli is totally unable to track on that board. He doesn't know where to go or what to do when he crosses over mid-slide. Die. Also Mouse trap is the worst. 25 minutes to set up…. then more frustration. My in laws must hate me as they gave him both (and tiny legos when he was only 2). But you would LOVE the game Zingo. When i worked with kids before my own came around I filed Zingo under "games the kids pick that don't make me cringe". Also I like Carriboo though it is super pricey. I picked most of one up at the DI for 3 bucks instead of 45. I spent many summer mornings at our neighborhood park playing Trouble with friends. I have always loved it. I love the sound of the popper. My boys were just meh about it. I feel the exact same way you do about Chutes & Ladders! Love Spot It and Sleeping Queens, too! We also have worn the heck out of Sequence Jr. And I love Guess Who? Maybe it's because I'm still not over my childhood jealousy that my cousin had that game and I didn't. I could never get enough of it. Just played it with my kids for the first time last week and it's as fun as I remember. Also, really funny to hear how my kids describe the characters: "does your person have a really big nose?" Oh my! Trouble makes ME want to gouge my eyes out. lol! We love cooperative games like Forbidden Island and Castle Panic because then its totally legal to "help" the little kids with their turns. It Has been a hit for my kids-same age as yours. It's surprisingly fun, and i enjoy playing it. My oldest also loves rack-o which i liked as a kid. Just found this again (had saved it and then forgot about it. This is perfect as it is soon the time to be thinking about Christmas gifts.